It’s now 8 ½ months I’ve been living with my brain injury post-concussion syndrome. It’s safe to say I’ve fallen off the blogging wagon the last couple of months. Not having broadband in my new flat definitely played a part but I’ve also had a few ups and downs and keeping my blog up-to-date just wasn’t a priority. I found it easier to sit in front of my phone and record videos instead. So here’s a few videos sharing what I’ve been up to and the progress with my recovery. Warning! This one has all the feels and might make you shed a tear or two. JP and I had been away up north for a while and the reality of coming home to life with my brain injury hit me hard. Really hard. I knew that I couldn’t leave my brain injury at home but being away for the first time since my accident was difficult. For sure there we made great memories with friends but the excitement I used to get coming home from a holiday wasn’t there. No coming home to run my business. After 7 months spending my life trying to heal my brain I was utterly fed up. If this was my new normal I just didn’t want it. 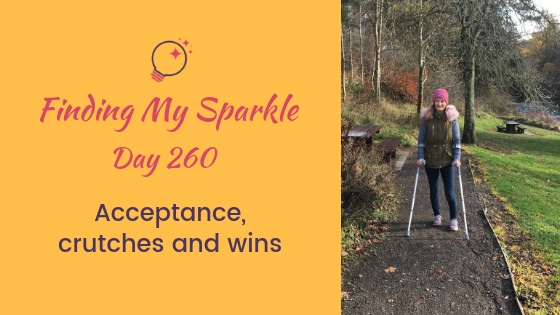 Towards the end of October and after another visit to the brain injury clinic where I cried my way through my appointment, I had a shift in my mindset and began to feel more positive again. Spending time with my warrior friends at Headway Dundee and Angus really helped as well as various appointments with occupational therapy, physiotherapy and my brain injury resource worker. I realised that I’d been putting myself under a lot of pressure to get back to the life I used to live. I was also trying to hold myself to my previous capabilities before my accident. Constantly comparing myself now to my life before the accident I was always feeling like I wasn’t good enough. I felt like I should be recovered by now and it wasn’t doing me any favours. So I got some advice from my consultant and my brain injury resource worker and got rid of the timetable I had. No more trying to treat my recovery like a job and scheduling things throughout the day. From now on I’d do the physio and noise sensitivity work at home whenever I felt able to do it and anything else was a bonus. Making a conscious decision not to put pressure on myself felt liberating. If I needed to spend all day lying on the sofa resting I’d do it and not feel bad about it. Life became more about focusing on what would make me happy every day. I even wrote a list of things that make me happy and stuck it on my fridge as a reminder. At the beginning of November I was a winner in the United Kingdom Acquired Brain Injury Forum Film Awards 2018. The aim of the competition was to raise understanding of acquired brain injuries in a 30 second video. When they told me I’d been shortlisted for an award they also invited me to London for the annual conference and awards ceremony. There’s no way I could travel and be around a lot of people so they asked me to film an acceptance speech incase I won. At physiotherapy a couple of weeks ago I was given crutches. At first to my complete horror and the usual tears. I’d been using my walking stick before then and to have two walking aids felt like a step backwards. It was explained to me that crutches would make me feel more independent, give me better stability and and help strengthen my legs. Once my brain learns a good walking pattern I’ll be able to move on to using my walking stick stronger and with better movement. I’m still getting used to using them and when I’m fatigued I forget what to do. Overall though I proper love them. I even blinged them up the other day. I can’t wait to show them to you! I’m still getting weekly physiotherapy sessions and I’m making wee improvements. At physiotherapy on Friday I did a bridge with straightening my bad leg. My hips were tilted down on the bad side and I had to work hard to straighten them and control my leg. It shakes a lot. I managed 3 with the support of my physio team. One of them had her hand under my leg so I could relax my leg onto her to control the shaking but I still did the exercise. Super proud! The 40 minute appointments still exhaust me after 2 months but I rest before I go, show up and give my all and they give me lots of homework. The improvements may be slow but it’s happening! So that’s a little taster of how my recovery has been going. I started this blog as a way to educate people about post-concussion syndrome and to help other brain injury warriors feel less alone during your scary times. Ultimately I know that I don’t have the same capabilities as I did before my accident. I’m taking each day as it comes and trying to live life without any expectation or pressure on myself. I will try to share more regular updates with you here, even if they’re wee ones. If you see me missing in action for a while, please don’t worry, I just need a little time out. What are your tips for living with a brain injury? Pop into the comments and let me know. I know how incredibly scary life can be when you’re living with PCS but I don’t want you to feel alone. I’ve got your back and if you need to chat any time, please get in touch. You’ll also find me sharing my journey on Instagram so feel free to connect and say Hi! And remember, you’re not broken, you’re finding your sparkle so do something every day that makes you happy! PS Don’t forget to click the link below to get the next instalment of my blog!